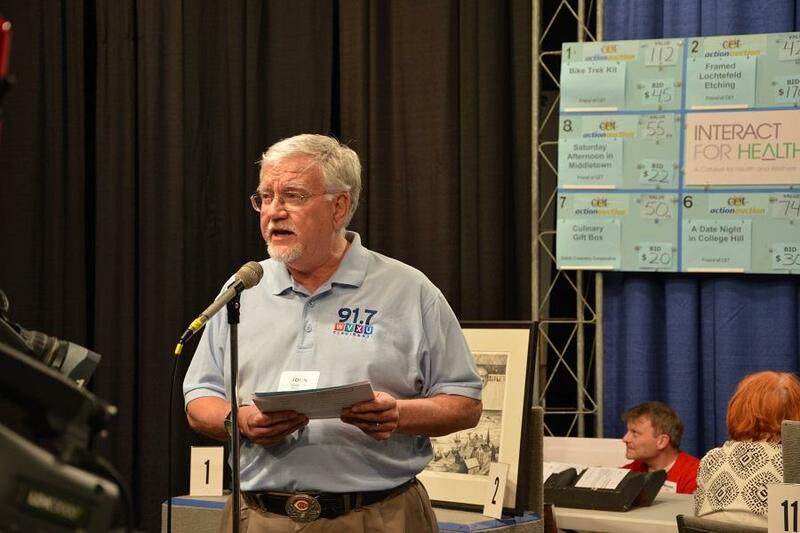 The 52nd "Action Auction" for the first time will be broadcast in Dayton. The 52nd annual Action Auction will continue to air as usual in Cincinnati 5:30-11 p.m. Tuesday-Friday April 23-26, and 3-11 p.m. Saturday, April 27, as well as be livestreamed online. In Dayton, it will only be simulcast 9-11 p.m. all five nights on WPTO-TV (Channel 14), the former Oxford TV station broadcast from WXIX-TV's tower near the Western Hills Viaduct. Dayton's WPTD-TV (Channel 16) will not interrupt its lineup for the Auction. Channel 16 viewers will still see Nova, Nature, Antiques Roadshow, This Old House Hour, Independent Lens and other regular programming. Kevin Reynolds, Cincinnati Public Radio community relations manager, auctioned several boards last year. WPTD-TV's "ThinkTV 16" website explains explains that the change was made as the stations approach the 10-year anniversary of Public Media Connect (PMC), created in fall 2009 by the merger of CET-TV and ThinkTV. 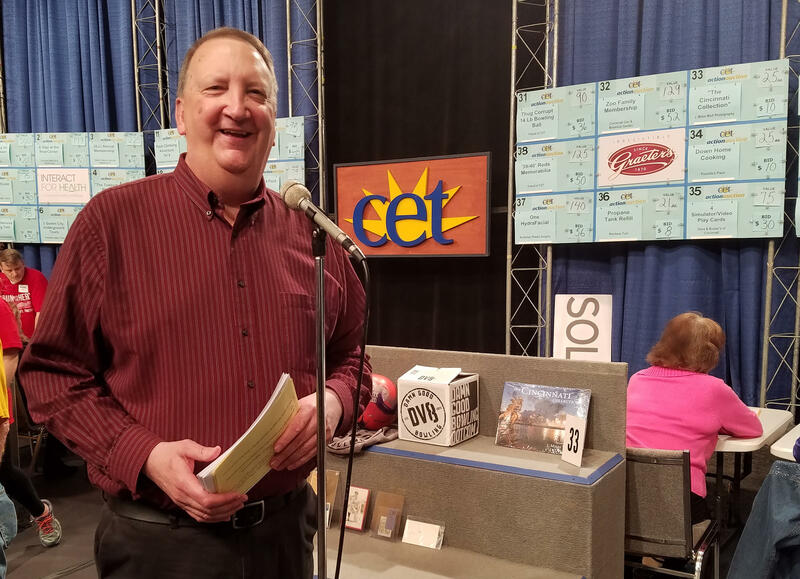 "After careful consideration PMC has decided that this year the Great TV Auction will combine with CET’s Action Auction bringing both events together for a regional broadcast that will offer viewers more goods and services to choose from," the website says. New this year, the Auction will feature "Dayton boards" with Dayton-area items 9-11 p.m.
"We've received great support from the businesses and volunteers who have supported the Great TV Auction in the past," says Kellie May, WCET-TV public relations and digital media specialist. 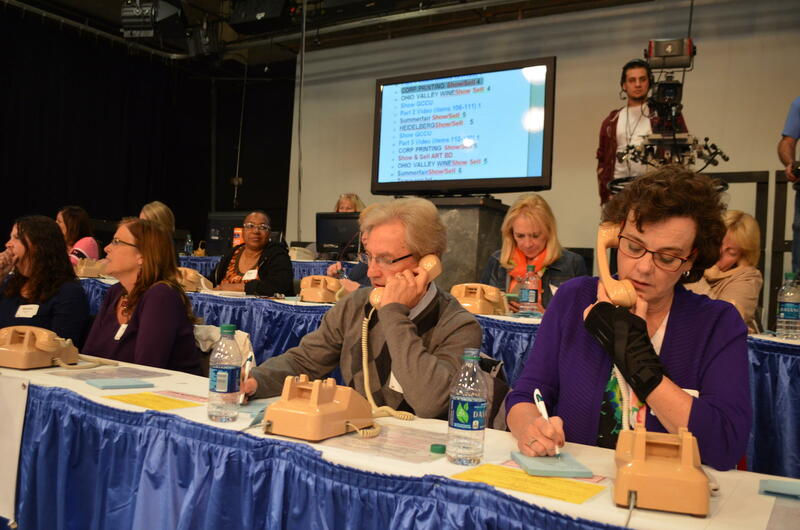 Hundreds of volunteers answer phones and take bids during the five-night "Action Auction" telecast. Donations from businesses and individuals are still being accepted, as well as volunteers who can help staff the auction, May says. Get more information from the CETconnect website or call the auction office at 513-345-6579. Cincinnati's original home shopping show offers viewers a wide range of gift certificates, tickets, goods, services, collectibles, art and wine. The most popular items usually have been gift certificates for restaurants, shopping, salons and other services; tickets to see the Reds, FC Cincinnati, Bengals, UC, Xavier and NKU games or concerts; and "unique experiences" for behind-the-scenes tours of restaurants, firehouses, TV stations or other businesses. They even let me sell a couple of boards last year! With the Dayton donations, the Auction will be extended from 10:30 p.m. to 11 p.m. or later, "depending on how quickly the boards go," May says. Why simulcast on Channel 14 instead of Dayton's main PBS affiliate? "The ThinkTV14 tower is still in Cincinnati, but the coverage does extend north of Cincinnati. We will be encouraging folks to watch the livestream if they can’t get ThinkTV 14 or would prefer to watch it online," May says. "We do get viewer complaints that regular programming is not available during auction. We are hoping this change will be a positive one for those viewers, while continuing to raise money for local public television in Southwest Ohio," May says. Dr. O’dell Owens, president and CEO of Interact for Health, will serve as Action Auction chairman for a ninth year. WCET-TV was the nation's first licensed educational TV station on March 11, 1955. It is "Greater Cincinnati’s leading provider of education and enrichment in both living rooms and classrooms, reaching more than 2 million residents, 470,000 students and 37,000 teachers," the station says. Public Media Connect serves more than 3 million people in these counties: Adams, Brown, Butler, Clark, Clermont, Clinton, Darke, Fayette, Greene, Hamilton, Highland, Miami, Montgomery, Preble and Warren in Ohio; Boone, Bracken, Campbell, Carroll, Gallatin, Grant, Harrison, Henry, Kenton, Mason, Owen, Pendleton, Robertson, Scott and Trimble in Kentucky; and Dearborn, Decatur, Fayette, Franklin, Jefferson, Jennings, Ohio, Ripley, Rush, Switzerland, Union and Wayne in Indiana.